Watch them jumping and doing their friendly tricks as they frolic and play in the wake of our Dhoni. While nothing with wildlife can be absolutely guaranteed, you will never have a better chance to watch wild dolphins playing in their natural environment than right here in the Maldives. 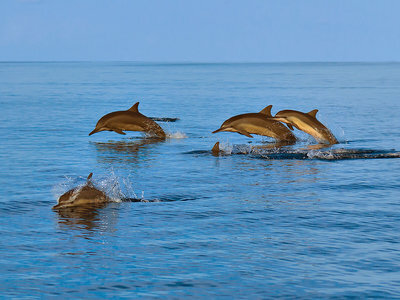 Dolphin Watching is one of the most fun-filled and moving excursions you can ever experience while in the Maldives, and will create lasting memories for years to come.